From the Department of Neurology (M.P., P.S. ), Department of Neuroradiology (H.A., S.H. ), Karolinska University Hospital; Department of Clinical Neuroscience (M.P., H.A., J.Y., S.H., P.S. ), Division of Clinical Chemistry, Department of Laboratory Medicine (A.S., I.B. ), Department of Neuroimaging (G.B. ), Karolinska Institutet, Stockholm, Sweden; Department of Biochemistry (A.S.), Faculty of Medicine, University of Khartoum, Sudan; and St. Erik Eye Hospital (J.Y. ), Stockholm, Sweden. Primary familial brain calcifications (PFBC) are a heterogeneous group of rare autosomal dominant disorders. Mutations in the PDGFB gene are the second most common cause of PFBC. A model for PDGFB-associated PFBC, hypomorphic PDGFBret/ret mouse, displays impaired blood-brain barrier (BBB), progressive brain calcifications and increased flux of the oxysterol 24S-hydroxycholesterol from the brain into the circulation.1,2 Only 8 families and 2 sporadic cases with PDGFB mutations have been identified so far, one of them a Swedish-Finnish family previously described as F13.1,3,–,6 Very little is known about the natural history of PDGFB-associated PFBC. Here, we provide a comprehensive long-term follow-up of the F13 family. The study was approved by the local ethics committee. The F13 family harbors the c.26T>G (L9R) mutation in the PDGFB gene1 (pedigree in figure e-1 at Neurology.org/ng). Participants consented to physical examination, cognitive assessment, radiologic studies, and biochemical analyses. Biomarkers for neuronal and BBB damage in plasma and CSF, including oxysterols, were analyzed at a single point. Dual-energy computed scans and brain MRIs were performed according to details provided in appendix e-1. The degree of calcification was measured with the Total Calcification Score (TCS).3 We also used software for image coregistration (Integrated Registration, GE AW server). In brief, the region of interest placed on the baseline CT is propagated in a semiautomated fashion to the follow-up examinations. Changes in Hounsfield units are measured as relative and absolute values. The progression of clinical and radiologic features is summarized in appendix e-1. Mean time of clinical follow-up was 5.5 years, and the time between 2 successive brain CT scans was 4.8 years. In brief, all the affected had a diagnosis of migraine with aura and displayed subtle movement disorders and mild eye movement abnormalities. Patient III:1, the proband, was diagnosed with mild language impairment (anomia, paraphasias, and impaired repetition ability) and cognitive deficits (reduced working memory) and has developed chorea and posturing. Her father, II:3, has developed mild motor features and impaired tandem gait. Patient III:2 has a history of mixed substance abuse; he did not progress radiologically but has progressive chorea. Patient III:3 has mild postural tremor, chorea, and significant cognitive impairment (anomia, visuospatial deficits, reduced working memory and information processing speed). The main phenotype features are displayed in videos 1–4 and summarized in tables e-1 to e-4. Patient II:3 has calcifications in the lentiform nucleus and in the white matter. The 3 patients in generation III have widespread calcifications in the basal ganglia (lentiform and caudate nuclei) along with varying degrees of calcifications in the thalamus, dentate nucleus, and white matter (figure 1, figures e-1 to e-3, tables e-5 to e-9). Two patients have cortical calcifications (III:1 and III:3). Using the TCS, we detected progression in 2 cases (III:1 and III:3), whereas the coregistration method detected progression in 3 patients (II:3, III:1, and III:3). An estimation of hydroxyapatite concentration in calcified areas is displayed in figure e-4. Density progression, as measured by change in Hounsfield units (HU), of calcifications in cerebellum, thalamus, basal ganglia, and frontal white matter in patient III:1. To the left axial (A.a and B.a) and sagittal sections (C.a) from the first CT scan done in 2009 and to the right sections performed in 2014 (A.b, B.b, and C.b). The sagittal sections display the right hemispheres of the brain and cerebellum (C.a and C.b). According to the TCS method, using the axial image could score the white matter changes as “moderate” but seem to be “severe” in the sagittal image. In the white matter (B.a and B.b), the HU increased by 142% or 124 HU, but the TCS remained unchanged at 3 points. In the lentiform nucleus (B.a and B.b), the HU increased by 29% or 70 HU, but the TCS remained also unchanged at 5 points. In the thalamus (B.a and B.b), the HU increased by 22% or 11 HU, but the TCS increased from 2 to 3 points. In the cerebellum (A.a and A.b), the HU increased by 44% or 17 HU and also increased in TCS from 2 to 3 points (for more details see table e-8). We obtained CSF from 3 patients with patient III:2 having an elevated albumin CSF/serum ratio and patient III:3 elevated levels of neurofilament light chain (NfL) in the CSF. Oxysterol levels were nevertheless normal in all the examined participants (table e-10). Brain calcifications are progressive in 3 individuals from the L9R family. All the 4 participants display some degree of subtle but progressive motor features and mild eye movement abnormalities. Chorea emerged in 2 patients of generation III (III:1 and III:3) and was progressive in another (III:2). Besides chorea, patient III:1 had a mild language impairment and reduced working memory. Patient III:3 has greater cognitive deficits than the index case (III:1). The coregistration method we tested here found evidence of progression in 3 patients and the TCS method in 2. Overcoming the ceiling effect of TCS is the main advantage of coregistration. Small sample size is the main limitation of our longitudinal follow-up. Two levels of penetrance exist in PFBC: one radiologic and one clinical. The radiologic penetrance in PDGFB mutations is high, but, despite calcifications, some individuals are asymptomatic. Reduced clinical penetrance has been reported in 3 other PDGFB mutations despite the presence of brain calcifications (table e-11). When brain calcifications will appear and whether their progression will plateau is unknown. Future work has to determine whether our findings can be generalized to other cases of PDGFB-associated PFBC or other forms of PFBC. Acknowledgment: The authors thank all participants, Dr. Ruth H. Walker, Dr. Erik Jensen, and speech therapist Liv Thalén. Author contributions: Dr. Paucar, Dr. Almqvist, Prof. Holmin, Prof. Ygge, and Med Dr. Bergendahl: study concept, data collection, and writing of the manuscript. Dr. Paucar wrote the first draft. Dr. Almqvist performed the radiologic evaluation. Prof. Björkhem and Dr. Saeed performed the oxysterol analyses and edited the manuscript. Prof. Svenningsson: study concept and editing of the manuscript. Study funding: Stockholm County Council. Martin Paucar was supported by the Stockholm County Council (combined clinical residency and PhD training program). Disclosure: Dr. Paucar has received research support from the Stockholm County Council. Dr. Almqvist, Dr. Saeed, and Dr. Bergendal report no disclosures. Dr. Ygge has served on the editorial board of Acta Ophthalmologica. Dr. Holmin has served on the scientific advisory boards of 2 companies not related to this study, holds a patent for Endolumina medical access device, has received research support from Astra Zeneca, holds a stock option for Smartwise Sweden AB, and has received royalty payments for potential future sales of products from Smartwise Sweden AB. Dr. Björkhem reports no disclosures. Dr. Svenningsson has served on the scientific advisory board of CBD Solutions AB, has served on the editorial board of PLoS One, and has received research support from the Swedish Research Council and ALF Stockholm. Go to Neurology.org/ng for full disclosure forms. The Article Processing Charge was paid by the authors. Accepted in final form June 2, 2016. Mutations in the gene encoding PDGF-B cause brain calcifications in humans and mice. Nat Genet 2013;45:1077–1082. 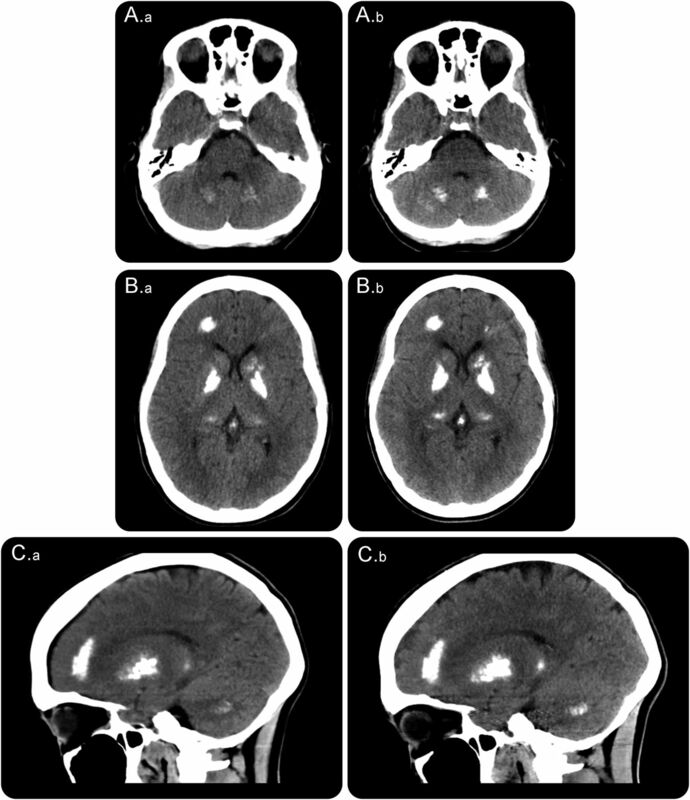 Phenotypic spectrum of probable and genetically-confirmed idiopathic basal ganglia calcification. Brain J Neurol 2013;136:3395–3407. PDGFB partial deletion: a new, rare mechanism causing brain calcification with leukoencephalopathy. J Mol Neurosci MN 2014;53:171–175.
. First Japanese family with primary familial brain calcification due to a mutation in the PDGFB gene: an exome analysis study. Psychiatry Clin Neurosci 2015;69:77–83. Clinical heterogeneity of primary familial brain calcification due to a novel mutation in PDGFB. Neurology 2015;84:1818–1820. Effects of a disrupted blood-brain barrier on cholesterol homeostasis in the brain. J Biol Chem 2014;289:23712–23722. Andaloussi Mäe M, et al. Functional characterization of germline mutations in PDGFB and PDGFRB in primary familial brain calcification. PLoS One 2015;10:e0143407.